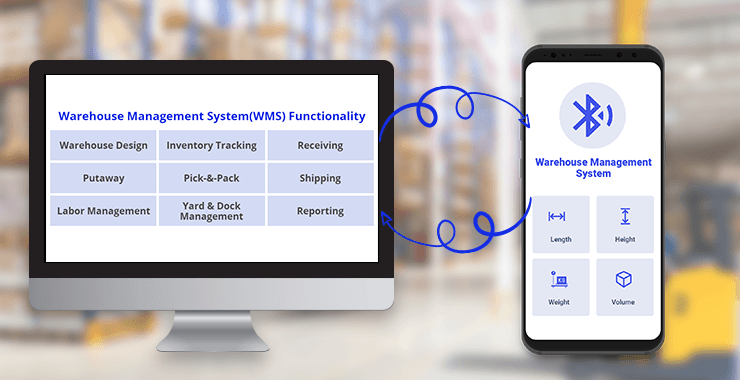 How BLE Mobile Apps Can Improve Efficiency of Your WMS? Warehouses are probably the hardest part of a logistics operation to automate. While a large number of warehouses have made a move from manual spreadsheets and lookalike software systems to warehouse management systems that entice automation; they are taken aback by slow input of data from the endpoints operated by manual labors and legacy software systems. The job of a quality checker is to check the inbound and outbound packages to and from the warehouse for integrity. A checker matches a package against the specification listed on the labels stuck to it like weight, dimensions, batch number, and manufacturing data. While a barcode reader attached to a quality checker’s computer can log batch number and manufacturing date to the system; the quality person have to check and log the weight and dimensions of the package manually, which slows down the flow of the data and hence the WMS. Since warehouses employ semi-skilled labors for the job, not all are proficient at handling complex UI of WMS. They tend to log weights and dimensions on manual sheets or spreadsheets, which not only lowers their productivity but also of the connected WMS. So if I am a quality checker at a fulfillment center, my job is to walk the entire space, find damage products, compare dimensions and weight before and after the damage, and then enter that information to a system to report the damage to the WMS. Many warehouse managers are addressing this problem around frequently calculating weight and dimensions by procuring weighing and measurement devices with external connectivity options. Wi-Fi is an excellent option but Wi-Fi is a major power hogger and you don’t want your personnel to charge those measuring and weighing devices every couple of hours. Bluetooth Low Energy or BLE has come about as a viable technology to connect those devices with the WMS without draining their batteries in short time. BLE beacons can run not hours but months on a single charge. Any piece of equipment that transmits BLE signals is called a BLE beacon. BLE beacons can be programmed to broadcast useful information for example weight and dimensions of a package in this case. iBeacon and Eddystone are the standards of reading those information from beacon devices on mobile devices over an iOS and Android app respectively. These mobile apps can read the useful information from the beacons connected to the device and display them in a comprehensible format; which the WMS can read and process for reporting and analytics purposes. Warehouse operators can accomplish a variety of tasks with incredible efficiency if you equip them with mobile devices and the BLE mobile apps. The app read information from any authorized nearby beacon and feed to the WMS. A large number of vendors are now shipping their equipment with some sort of connectivity and include BLE beacons as the bare essential and because of battery constraints. These pieces of equipment come with SDKs to integrate them with your mobile apps and read the signals when they broadcast a fresh piece of information over BLE; which could be weight or dimensions of an item. For most weighing devices, the attached beacon will transmit a signal with the calculated weight. The application polling the broadcasted signal will update the app with the weight of the product. For calculating dimensions, a warehouse operator has to use a digital scale, which will update the app with length, breath, and height of the product. The person operating the device can update the information to the WMS. Calculating dimensions may not still be as efficient as you expected them to be. However, that is the fastest way around and much faster than logging the three dimensions manually on a piece of paper or spreadsheets. BLE beacons are excellent source of indoor navigation. Three nearby beacons can located where you are in a warehouse using parallax method and give you direction to your intended location. If you are collecting a few products to ship tonight, you can seek help from the mobile app; which will take you to places in warehouses where the products are placed. So coming back to the quality check example, the quality testing people expect the items to look and behave the same at the time they enter the warehouse and leave. They tend to check the weight and dimensions of an item when it enters and leaves the warehouse. Any difference in those quantities, before and after; will flag the item ‘damaged in warehouse’, which could be pests or an instance of mishandling by operators. Whatever the case, the quality people can identify the problem faster and thus can address the root at the earliest; which will avoid the problem in the future. So if you’re invested in any parts in a warehouse that is in a desperate need of automation; BLE equipped warehouse equipment would be a great start. We would develop a robust BLE mobile app to support the BLE beacon device and the integration would make your warehouse better, faster, and efficient.